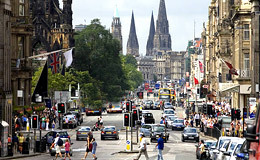 From Edinburgh city centre to the surrounding areas, we can get you from A to B at cheap rates. Whether you’re nipping to the supermarket or visiting friends on the other side of town, it’s nice to get from A to B without worrying about your transportation. No one should have to rely on buses. They rarely arrive on time, there’s no space to put your shopping bags and they don’t drop you on your doorstep, even if it is pouring down with rain! The beauty of travelling with Capital Cars is that your vehicle will consistently arrive on time and your driver will always be friendly and ready to lend a hand. We will take you anywhere within Edinburgh and the surrounding area, and ensure that you travel in safety and comfort every time. We can take you from Edinburgh city centre to Leith, Dudingston, Stockbridge, Morningside, Bruntsfield, Newington and anywhere else in the surrounding area that you may need to get to. It’s easy to book a cab with us. You can do it the old fashioned way over the telephone, download one of our booking apps or book it right here on the website with our online booking form. There are several ways to pay too, you can even pay right now if it suits you! Remember, we can take you on longer journeys too. We offer city to city transfers and can even take you on a tailor made tour. Our aim at Capital Cars is to make your life a little easier, whether your journey takes you just around the corner or to the other end of the country. We’re looking forward to the trip!